The project is near completion. 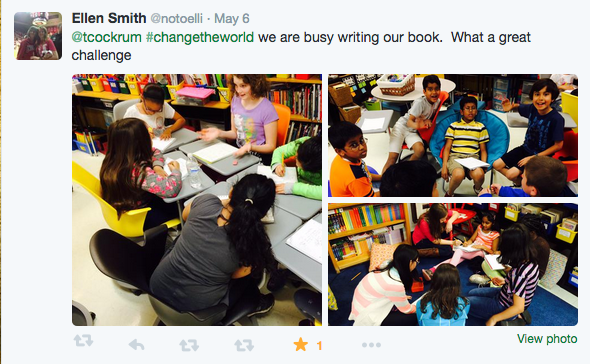 On May 6, our 5th & 6th graders embarked on a journey to write a book in one day. Originally, we had 6 other classes that agreed to do it with us. 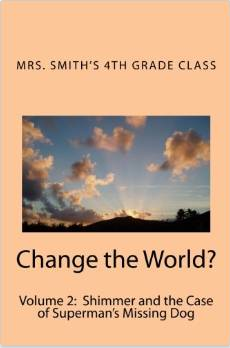 As the day grew closer, 3 classes had to drop out for various reasons and one class was MIA on the day of the book. We set the project up so that we could complete it independently, so, while it was nice to have two other classes still participating, we could have still finished it alone. 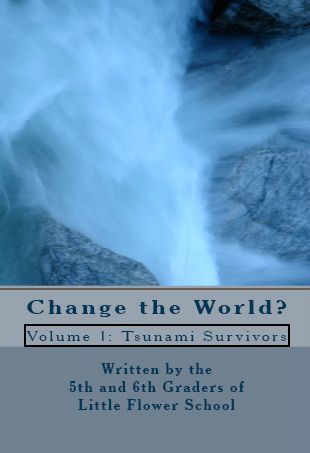 Two of the books can be purchased on Amazon: “Tsunami Survivors” & “Shimmer and the Case of Superman’s Missing Dog”. I’m still waiting for a 3rd class to send me their book for print. There are also .pdf versions at the bottom of this post free for you to download. Due to an expected delay in statewide testing, we lost 2 hours in the morning. While we still finished, that 2 hours would have been nice to have those two hours to breathe a little easier and have more time for editing the final book. Prior to lunch, the kids were very engaged, asking great questions as they planned their story and collaborated. We had to conflict manage a bit more than I expected having to solve problems not related to the story so groups could get back to work. First, we had the class list all the elements (characters, plot, conflict, setting, etc.) they needed in their story. Then we went element-by-element and had suggestions. As a group, the students voted on 3-5 choices for each element. 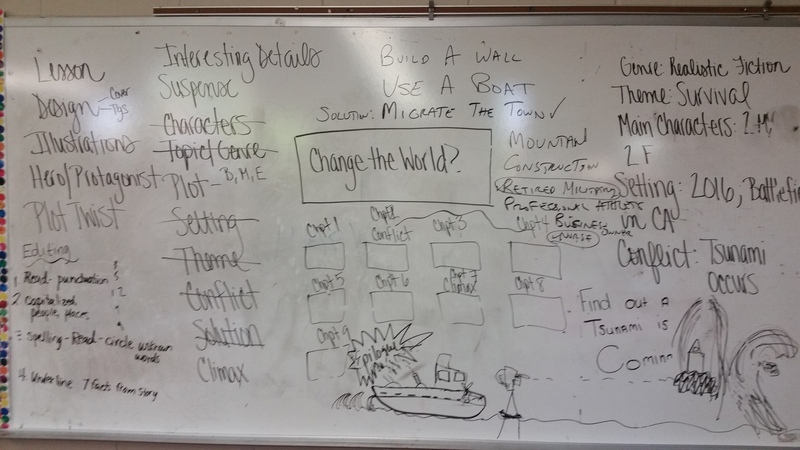 Here is our brainstorming board after we were finished. Once the elements were all determined, we divided them into groups to begin writing. Each group was responsible for one chapter. Students talked with their group about what direction they wanted their chapter to take but quickly realized they needed details from other chapters. Although their was some conflict during this process, I was pleased to see the students really analyzing their story. If a group wanted a character in chapter 8, they realized they needed to get an earlier chapter to introduce that character. One early chapter realized they had too much happening too soon for the story, so they made it into a flashback to use as character development instead. A lot of great discernment was happening on how to construct a good story. We then reconvened every group and had them explain to everyone what plot points they were going to write into their chapter. As a group, we smoothed out some discrepancies between chapters, made group decisions on the final story and then began writing. Students collaborated with their group in Google Docs to write their chapter. We had a plan in place for early finishers, but we didn’t have any of those. 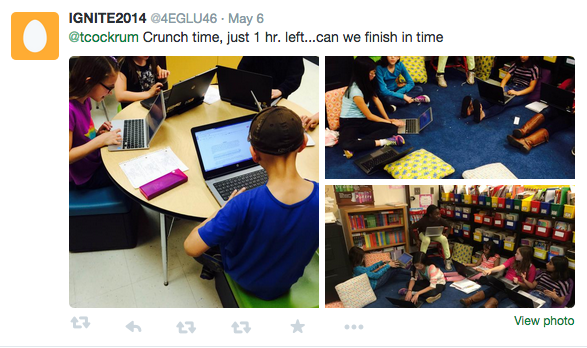 Students were typing and revising up until the final minutes. Since we had lost the 2 hours in the morning, we asked a member from each group to go into their document that night and give their chapter one final edit and clean up. I then took those chapters and used Amazon’s Createspace to publish the book. We would have liked to do a Google Hangout with one of the other classes participating, but I realized we wouldn’t have the time to do it. 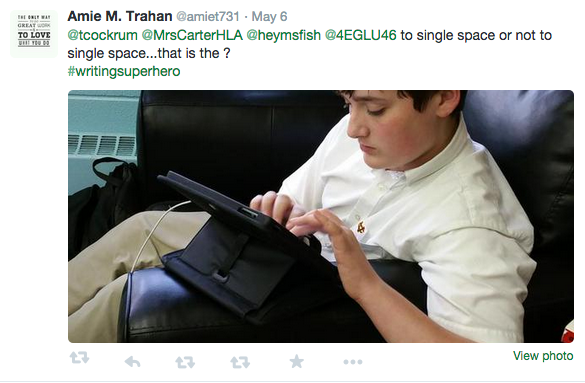 We did tweet with the other classes and let our students see the others’ tweets to remind them this project was bigger than just their classroom. The kids are still asking to read the other schools’ books! Overall, it was a wonderful experience and we are already in the planning process for next year! Amazing! Such a rich learning experience. Good luck with all your endeavors! I don’t mind at all. Thanks for the comments.